The right tools make all the difference. Using the right garden tools can help make gardening easier and more fun. Garden catalogs and stores are full of supplies. It seems there's a special tool for every task. But there are a few that every gardener should have, because they make many jobs easier. Basic types that every gardener should have include a shovel or spade, hoe, rake, trowel, and pruners. A shovel is essential for any job that involves moving around soil, mulch, or other materials. Shovels come in many styles. A round tip shovel with a long handle works best for most digging and planting jobs. For lighter tasks such as transplanting you may find a shovel with a short handle easier to use. A shovel with a square end works well for leveling areas for patios or walkways, squaring off trenches, and scooping up piles. A spade has a long narrow head and flat blade that is designed for cutting. A spade is ideal for transplanting and dividing perennials and shrubs, trenching, and edging beds. A spading fork is another useful digging tool. It looks like a pitchfork but has a shorter handle and wider tines. A spading fork is ideal for loosening hard soil. Spading forks are also used for turning compost, spreading mulches, and digging up roots. 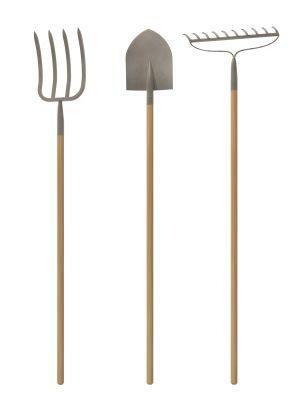 A hoe is useful for preparing seed beds, weeding, and cultivating gardens. Several different styles are available. The traditional hoe consists of a long handle with a flat blade set at a right angle on the end. The blades come in various widths. A hoe with a pointed, heart-shaped blade is useful for opening seed furrows and weeding in narrow spaces between plants. A cultivator has pointed tines, similar to a rake and is used to remove shallow rooted weeds and break up the soil surface. Rakes also come in many styles. You will want a good bow rake, which has short metal tines on one side attached to a metal frame. Bow rakes are used for leveling soil and removing clods of earth and rocks before planting. You can also use the flat side of a bow rake to smooth soil before planting. A lawn or leaf rake is used to gather up lightweight materials such as leaves, grass, and weeds. Lawn rakes usually have triangular heads and are made of metal, bamboo, or plastic. Choose any durable rake that feels comfortable to you. A trowel is like a little shovel and comes in handy for small jobs. Trowels are perfect for planting seedlings and bulbs or digging small weeds. You will need a pair of pruners, or clippers, for shaping plants and removing spent flowers and dead or damaged foliage and branches. Select a pair of pruners that fits your hand comfortably. It's worth investing in a good pair of pruners, because they'll work better and last longer. There are many other garden tools that are nice but not necessary. A wheelbarrow or garden cart is handy for moving materials around the yard. In addition to your pruners, tools that will make maintaining trees and shrubs easier include hedge shears, loppers, and pruning saws. A pick mattock is handy for digging through hard packed soil and clay. The rotary tiller is one of the power tools most commonly used by gardeners. Once you become an experienced gardener, you will learn which specialized types will be helpful for you to own. Garden tools are available in many price ranges. Bargain-priced tools often wear out quickly. Quality tools are more expensive, but will last for many years if you care for them properly. Maintaining regularly assures that they will be ready for your next garden project. Following a few basic rules will add years of life to your garden tools. Always remove the soil from your digging tools after use. To prevent rust and rot, never put your tools away wet. After each use, wipe the metal parts of pruners with an oily rag. Sharpen your cutting tools and the blades of shovels and spades thorughout the gardening season. Be sure to thoroughly clean any that have been used for chemical applications. Fertilizers and other chemicals may corrode metal parts. Once each garden season, rub linseed oil into your wooden handles to help preserve them.